Setting a 75' wood truss over a new gym. This is an unusually large wood truss more than twice the length of the truck. Setting a light pole at "The Empty Cross" & bronze sculpture Gardens here in Kerrville on Interstate 10. This unique Christian shrine draws more than a 100,000 visitors from all over the world every year. Lives are reborn here and walk away changed individuals. Many, many volunteers as well as myself have found it a great blessing to give our time, money or service here as offered to King Jesus. Family owned and operated since 1980, Mikes Crane & Services has built a reputation for delivering excellent workmanship, dependability and professionalism to the residents and businesses of Kerrville and the surrounding areas. We are your go-to source for lifting beams, trusses, air conditioning units, pools, hot tubs and more. Mikes Crane & Services has been the premier crane rental in Kerr County, TX for over three decades. We offer a full line of crane services, including lifting trusses, beams, pools, hot tubs and air conditioning units. We pride ourselves in providing industry-leading service that exceeds expectations, every time. 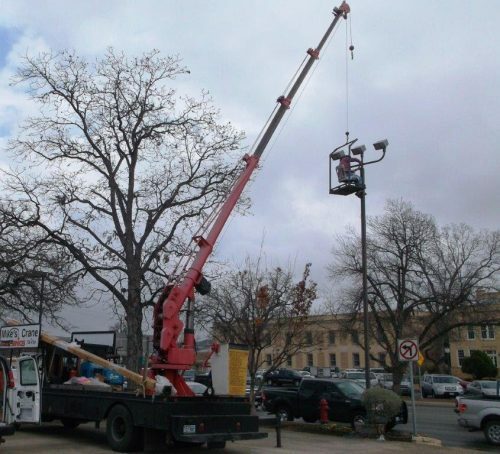 Our leading reputation is built on our one-hour minimum on-site base service and the most competitive prices for crane service in Kerrville. It’s easy to see why home and business owners throughout the region have continued to make Mikes Crane & Services their crane source for generations. We are locally owned and operated, established in 1980. We provide a one-hour minimum on-site base service. Our prices are the most competitive in the region. We bring decades of experience to your project. I have carried this “invitation” mounted on the bucket since 1991. It faces all motorist who are stopped behind the truck at a red light, who drive behind or when pulled up at a job site. It is my own testimony and inspired invitation to those who read. Over the years many have shared with me their conviction and decided to come to Jesus. 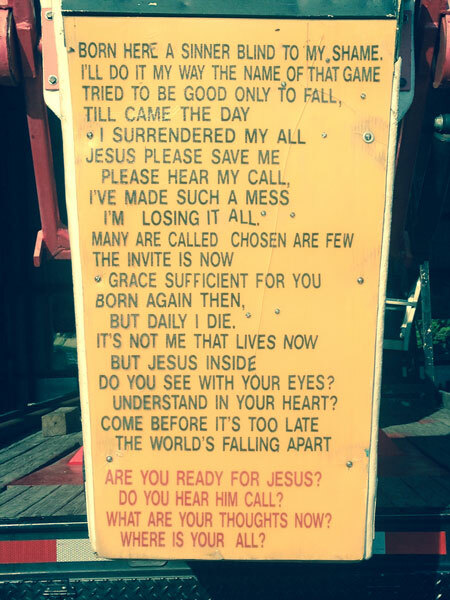 I consider this as one of the greatest privileges of my entire life to be known for carrying this sign for my Lord. This is the reason it is included and prominently displayed on this website. May God also bless you! An older pic before boom repainted showing single man chair lift. This by far is the most comfortable way of working up high in a variety of applications when tools, paint or chainsaw is needed. Used in service, installation, painting, no-impact tree removal in conjunction with two load lines. One line to carry chair lift, the other a tree limb, antennae, sign or etc. Contact Mikes Crane & Services today for professional, affordable services for your next crane-assisted project.